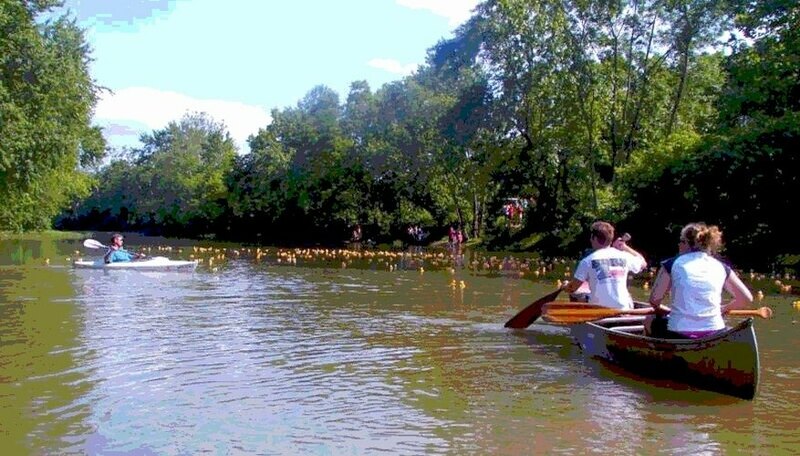 A great way to raise funds for an organization is to sponsor a rubber duck race. Get a team of people together who are interested in organizing and participating in the event. Make sure you get people who aren’t averse to tromping around in creek water. Decide how many ducks you think you can sell and how much money you hope to raise from this project. Purchase rubber ducks online. You might want to start out with 500 ducks, selling them for $5 or $10 each.You don’t sell the actual duck; you sell its corresponding number. For example, Duck # 38 is sold to Joe Jones. Joe doesn’t take physical possession of the duck. The ducks remain in the possession of the duck team. Number the ducks using a permanent black marker. Make the numbers large so spectators watching from the shore can see them. Decide when and where the race is going to take place. You need a body of water with a current. Advertise the event in the newspaper and on the radio. Decide on rules ahead of time, such as when are you going to stop selling the ducks. This can vary from several days before the event to up until the time of the race. Make sure to get the buyer's name, phone number, and address when the ducks are sold so you can contact him after the race if he's a winner. You may want to make it a rule that you have to be present to win.One of the duck team members must keep track of who bought what duck so there is no confusion at the end. At the race site, display several poster boards showing who owns what duck. Another duck team member must keep careful track of the money. Before the race, you must be decide how much of the money you’re going to give away and how much the organization is going to keep. Then you must decide how many winners there will be and how you will divide the money. You should announce this in advance of the race. It’s also fun to give a cash prize to the last place duck for just hanging in. The team must decide where the starting line is and where the finish line is. The team should also decide how they’re going to ‘dump’ the ducks in to the water. One city puts the ducks in large trash bags and hauls them to an old trestle that spans the creek. The ducks are dumped from the trestle at a specific time. Have people in the water in canoes and kayaks. This adds to the festivities but these duck-herders are also there to help untangle ducks that get stuck in the brush and to resuscitate ducks that take on water.The people in the watercraft should have walkie-talkies, as should the people at the finish line, so play-by-plays can be given: Duck # 402 is in the lead (and so on). It adds to the competitive nature of the event.Someone at the finish line should have a bullhorn so he can announce to the spectators which ducks are in the lead or in last place. Construct a finish line. You can do this in a variety of ways. One city opted to pound stakes into the creek bed (in the water). They ran a waterski rope through swimming pool noodles, stringing several noodles together between the poles. This design created the V-shaped funnel, which led to the finish line. The noodles kept wayward ducks in bounds and in the competition and the noodles also added color to the event. The funnel narrows down to a small opening that only allows one duck through at a time, which is necessary to be able to clearly determine which duck is the winner. You need a duck catcher. He grabs up the ducks in order, careful not to get them out of order. The ducks come swiftly, so be ready. Other people at the finish line should have fishnets so they can capture ducks that are sprinting downstream. Don’t let them to get away. Collect all of the ducks and re-use them the next year.